Let me start by saying that this post contains ZERO judgment or graphic animal cruelty videos. We are all at different states of awareness and rather than taking an extremist route by showing you heartbreaking clips or breaking down the cruelty (how it’s done), I’m going to share heartwarming stories, videos, and celebrate the brave souls (both human and animal)….AND there will be LOTS of recipe links, so be sure to read to the end. Thanksgiving is a difficult time for me, as it is for most plant eaters. While the day itself is special, as it reminds me of the wonderful memories growing up with my family and sitting around the table at my grandparents house, the main attraction and kitchen time was based around the turkey. It’s estimated that 46 million turkeys are killed for Thanksgiving alone. FORTY-SIX MILLION. While it’s been 25 years since I’ve eaten meat, I know it still remains a huge part of the holiday. Why a turkey symbolizes a day of thanks is beyond me. I get super emotional this time of year because I DO know the evil process about how they’re raised, treated, and slaughtered to eventually be sold in stores. Have you ever been around a turkey? A living, breathing one? You might be surprised to learn that they’re very affectionate, intelligent beings. I’m including some happy videos of them. And for those interested, you can also help by donating money to the Farm Sanctuary’s Adopt a Turkey project. All of the recipes linked here are gluten-free, vegan, and soy-free; a lot of them are oil-free as well. I could have included A LOT more recipes and narrowing them down was really hard! Creamy Artichoke Spinach Dip (without the junk) >> Plant Powered Kitchen >> This dish has made it’s way to family gatherings a few times and it has ALWAYS been a huge hit. Lick-the-bowl-clean kinda good. And it’s kid-approved! Great with chips, crackers, veggies, or even on pizza or a quesadilla! Below is an old pic from when we made it and spread it on top of gluten-free flatbread. Dairy Free Spinach Artichoke Dip >> Primally Inspired >> Replace the chicken broth with veggie broth and you’ve got yourself a vegan and AIP dip! We’ve got a lot of ideas running through our heads for appetizers, but I’m thinking this one will make an appearance at Thanksgiving! Vegan Queso Blanco Dip (Mexican White Cheese Dip) >> Veggies Don’t Bite >> One of my very favorite dips/sauces before I had to eliminate nuts. I promise you, dairy loving folks will go crazy over this! We paired it with just about anything and everything – heck, you can even give your mashed potatoes a makeover with this HEAVENLY recipe! Ooooh! Or serve it with some crusty bread! Lemon Cranberry & Pistachio Cashew Cheese Ball >> The Plant Philosophy >> Another appetizer that was a huge hit at two of our family gatherings last year! Willow picked off the cranberries and pistachios (our silly, selective eater) but devoured the actual “cheese” and paired it with some gluten-free crackers. SO. GOOD. Smoky Roasted Red Pepper Cashew Dip >> Veggie Inspired >> Yet another FANTASTIC and super simple dip that will have your guests going back for seconds or asking for the recipe! Excellent with fresh veggies, crackers (or chips), or bread! Life-Affirming Warm Nacho Dip (an Oh She Glows recipe featured on Plant-Powered Kitchen) >> If you own the Oh She Glows cookbook, you can also refer to this recipe there. We’ve made this for a few family gatherings and it was always the first dish to be devoured. SO good!!! 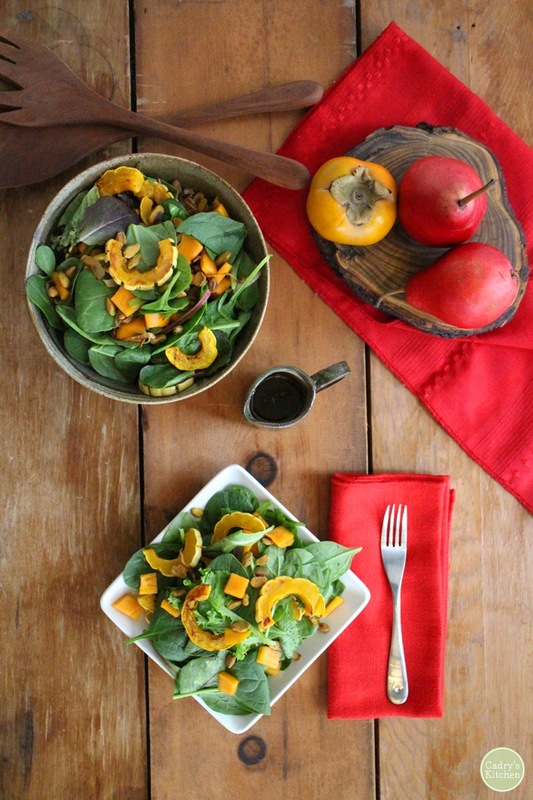 Delicata Squash & Persimmon Salad >> Cadry’s Kitchen >> This recipe would be a perfect addition to your Thanksgiving menu! I love how unique this salad is and while I haven’t made it yet, I DO LOVE all of the ingredients. Besides, you’ll learn more about persimmons if you read Cadry’s post…I know I did! Look at how beautifully Cadry presented it! So festive! 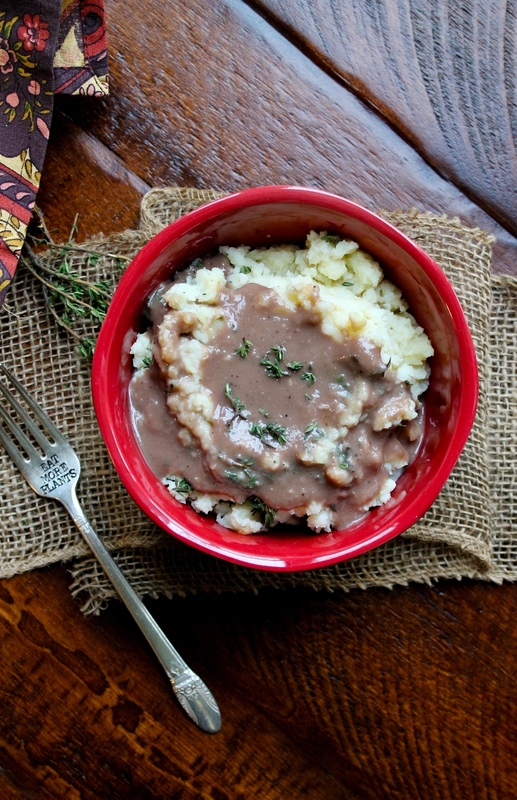 Fluffy Vegan Buttermilk Mashed Potatoes >> The Vegan 8 >> We made these for Thanksgiving last year and oh, my! Fluffy, creamy, and gone in a flash. And you guys…they’re oil-free! I searched my computer for the photos of these amazing potatoes, but could not find them! So, below you’ll see a photo from Brandi’s blog. Vegan Baked Oil-Free Hushpuppies >> The Vegan 8 >> I honestly couldn’t tell you how many times we’ve made these…four? Maybe five? I guess that just goes to show how incredible they are! All of my family members (even extended family) went crazy over these dangerously delicious, almost melt in your mouth biscuit-y goodies! 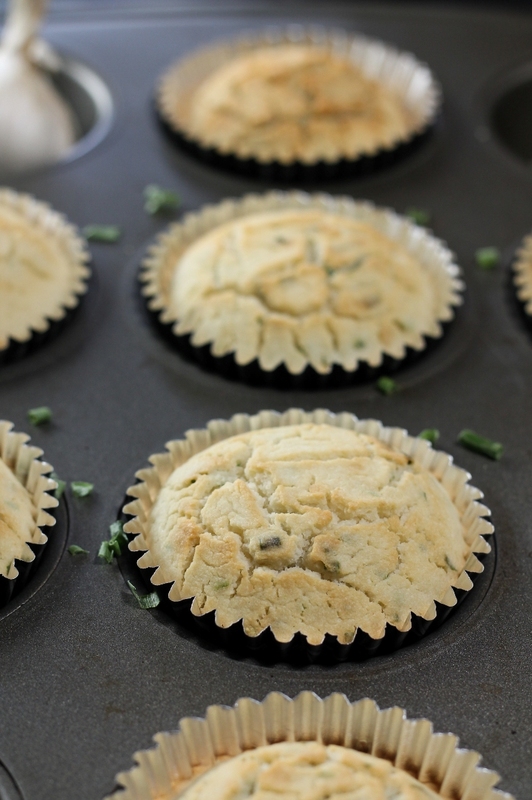 Vegan, Gluten-Free Garlic Chive Dinner Muffins >> The Vegan 8 >> Another amazing recipe by Brandi! They would go perfectly with pretty much any main dish or salad! Green Bean Quinoa Celery Salad >> Canned Time >> This beautiful salad, created by Angela, looks so festive – you could serve it at Thanksgiving or Christmas. I can just imagine the lovely balance of textures here, too – between the crunch of the celery and tender quinoa, I bet this is incredibly satisfying! Marriage-worthy Roasted Brussels Sprouts >> Cake Maker >> These are just like the title states…marriage-worthy. You WILL LOVE them!! We’ve made these SO many times and as crazy as this sounds, I think we’re making these for Thanksgiving AND Jenn’s recipe for brussels (you’ll see the recipe below). What can I say, we LOVE Brussels sprouts! Sweet Potato & Herb Savory Muffins >> Feasting on Fruit >> I have not made these yet, but they’ve been on my list to try. I REALLY wish I wasn’t following an AIP diet right now!!! Rosemary White Beans (Zoes Kitchen Copycat) >> The Vegan 8 >> We actually made a meal out of these earlier this year and Willow even enjoyed them! Insanely creamy, full of flavor, and guilt-free. This savory dish would be a great addition to your Thanksgiving menu! Below is a photo of these beans paired with sauteed kale + avocado slices. Peas with Scallions and Dill >> Veggies Don’t Bite >> You guys. I don’t like peas, but we made these for Thanksgiving two years ago and I actually ate (and enjoyed) some! They pair perfectly with mashed potatoes or any of the loaf recipes I’m linking below under “Mains” – this is a simple, yet flavorful dish! Smoky Maple Roasted Carrots >> Veggies Don’t Bite >> I love how pretty this dish looks! Very autumnal and comforting. While I’m not making this for next week, I plan to try it very soon! 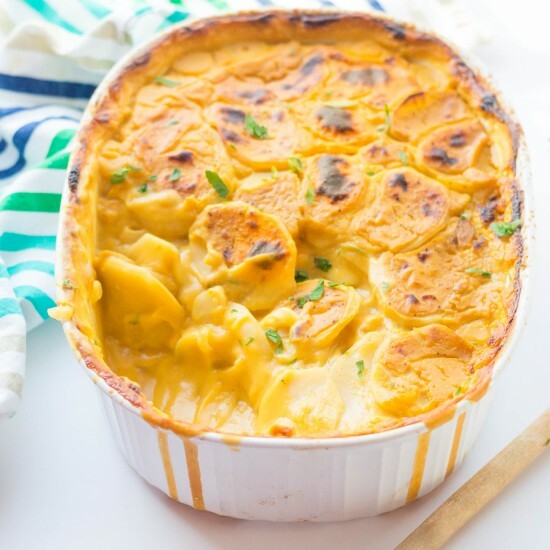 Scalloped Potatoes >> Cruelty Free Family >> I debated putting this recipe under “Mains” because I’m pretty sure I’d be content with just a giant plate of this. Haha!! OK, confession…I haven’t tried this recipe (yet), but who can go wrong with cheesy potatoes AND without the guilt! Grain-Free Sage and Pecan Stuffing >> In Sonnet’s Kitchen >> I pinned this recipe quite some time ago, but haven’t tried it yet. Since I know a few of you are watching your grains intake, I wanted to include it here! I’d totally make it this year if I could eat nuts!! 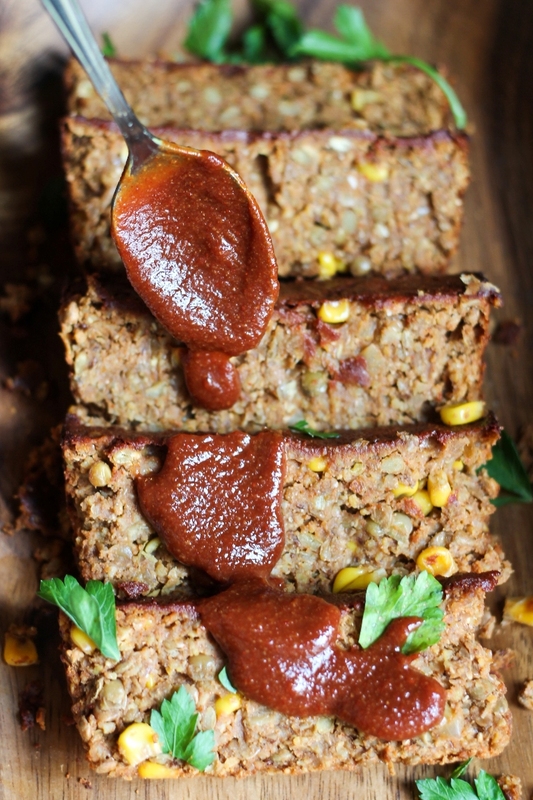 Vegan Oat-Free Spicy BBQ Lentil Loaf >> The Vegan 8 >> My Mom made this last year for Thanksgiving and it was amazing!!! No one missed the turkey and if they did, they certainly didn’t let on. I happily enjoyed the leftovers, too!! Butternut White Bean Puree w/ Roasted Brussels Sprouts >> Veggie Inspired >> Here’s the other Brussels sprouts recipe I mentioned earlier! SO good!! While I haven’t tried them with the Butternut purée, I can attest to that delicious glaze that goes along with this recipe and of course the brussels – the red onions are the perfect addition! Shepard’s Pie Stuffed Acorn Squash >> The Plant Philosophy >> I have not tried this recipe yet, but we are making it for this Thanksgiving! I love squash so much AND potatoes, so I’m pretty excited. We’ll be making a couple of minor adjustments for my portion to keep it AIP friendly…I’m pretty sure you’ll be hearing more about this recipe in my November Favorites post coming soon! Vegan Thanksgiving Power Bowl >> Feasting on Fruit >> While I personally haven’t tried this recipe yet, there is A WHOLE LOTTA YUM in one bowl! Literally all of your Thanksgiving favorites in one bowl! Potatoes, cranberry sauce, “stuffing”, lentils, and greens. I’m a sucker for food thrown together in a bowl. Perfect for those attending a gathering where you’ll be the only vegan. Creamy Autumn Pumpkin Pasta >> Strength & Sunshine >> I have been SO anxious to try this recipe created by my sweet friend, Rebecca! Look at how comforting and dreamy this looks! Who needs turkey when you can have a bowl of this deliciousness?? 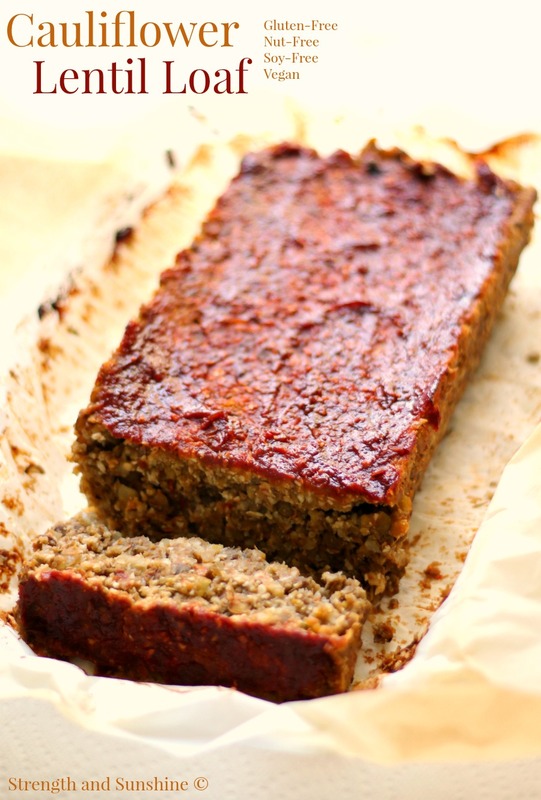 Vegan Cauliflower Lentil Loaf >> Strength & Sunshine >> Yet another Thanksgiving-esque recipe! If my gut could be friends with cauliflower, I would absolutely make this for next week’s gathering. Definitely check out her recipe!! Autoimmune Paleo Apple Crisp >> The Curious Coconut >> I LOVE this recipe and I know that I already talked about it in my October Favorites blog post, but I’m mentioning it again because this is what I’m bringing for dessert next week for our family gathering. 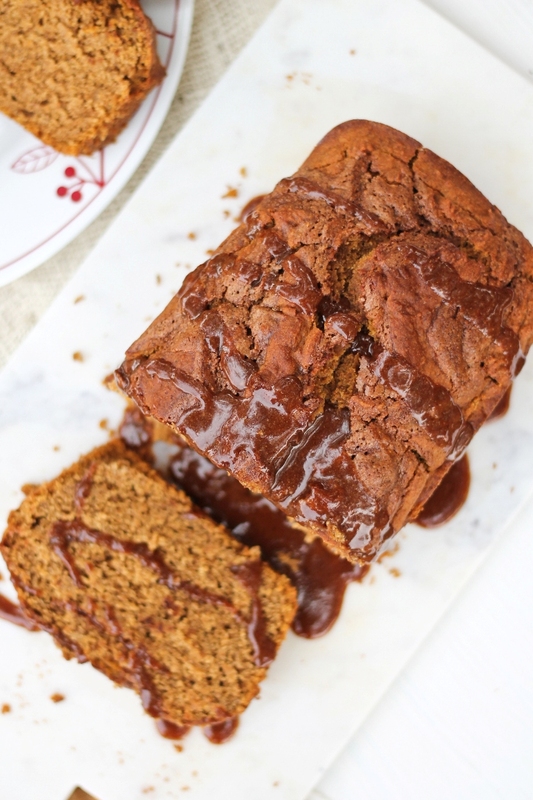 Gluten-Free Vegan Caramel Crusted Pumpkin Loaf >> The Vegan 8 >> My Mom made this amazing recipe for last year’s Thanksgiving and it was a huge hit! Again, another failed search in finding last year’s photos! Gluten-Free Pumpkin Cream Pie >> The Plant Philosophy >> This was my contribution for last year’s Thanksgiving gathering – it was soooooooo good! Pumpkin Fudge Brownies (Vegan & Gluten-Free) >> Veggie Inspired >> Pumpkin + chocolate! Need I say more? These look AMAZING!! I’ve been meaning to make them for my family, but I’m sure I would cry because I can’t eat them right now. *Sigh* My list is growing longer by the minute and when I can eat “normally” again, I’ll be wishing we had more meals in a day! Vegan Pumpkin Creme Brulee >> Feasting on Fruit >> This was one of our favorite treats from last year…I think I made it three or four times ❤ Huge thumbs up from all of my family. 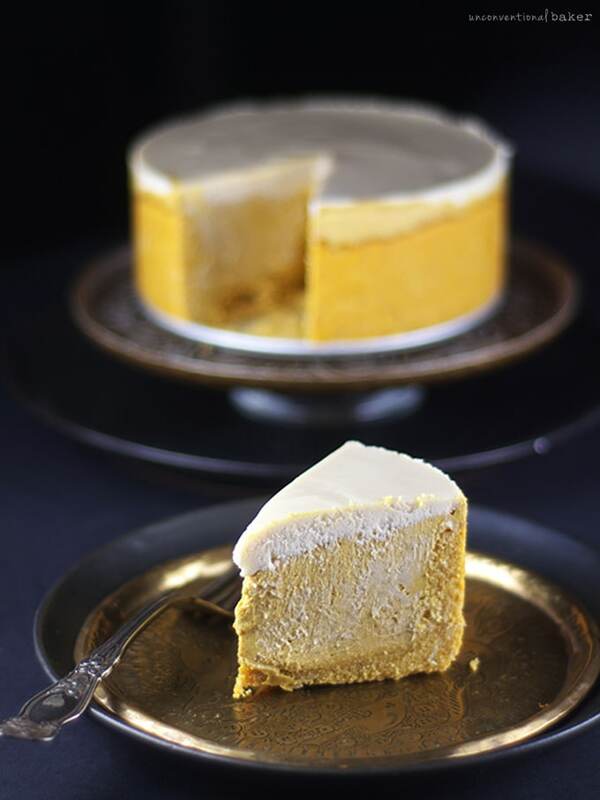 Pumpkin Cheesecake >> Unconventional Baker >> How incredible does this look?!??? Audrey is the queen of gorgeous treats. While I haven’t had this specific one, I can tell you that ALL of the recipes I have tried were nothing short of amazing. She offers up two variations (one with a baked crust or a nutty, no bake one) – both look divine! 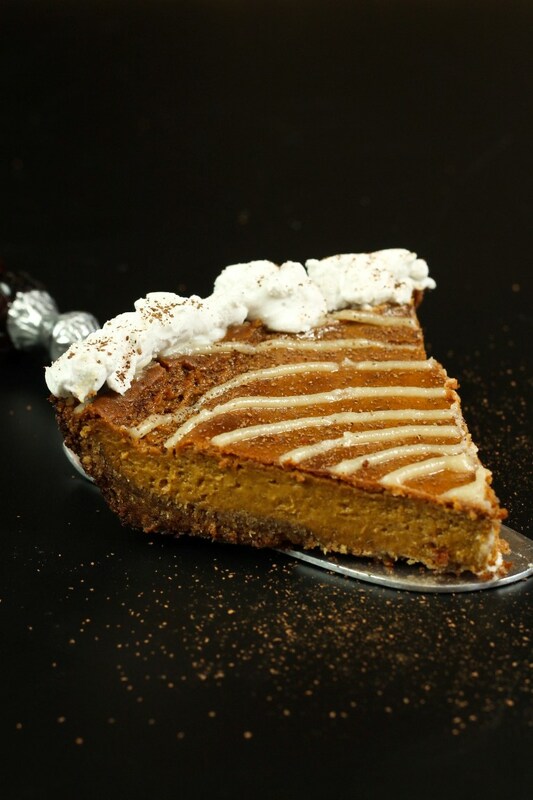 Vegan Cinnamon Roll Pumpkin Pie >> The Vegan 8 >> Cinnamon. She had me at cinnamon. And the beautiful photos. Good lord! I feel like there needs to be a day for just Thanksgiving desserts because there are A TON of drool-worthy recipes here. Vegan and Grain-Free Pumpkin Pie Cups >> Feasting on Fruit >> Pumpkin pies in mini form? Yes, please! These look so perfect and wait until you see the ingredient list! So simple! Gooey Pumpkin Spice Latte Chocolate Pudding Cake >> Oh She Glows >> You can’t go wrong with an Oh She Glows recipe. I have yet to try one I didn’t fall in love with – so while I haven’t made this one yet, I’m pretty sure I’d enjoy it. Mini Sweet Potato Pies with Maple Cashew Cream >> The Organic Dietitian >> How adorable and delicious do these look???! Mmmm!!! I’m a fan of any mini treats! And with sweet potato! So there you have it!! 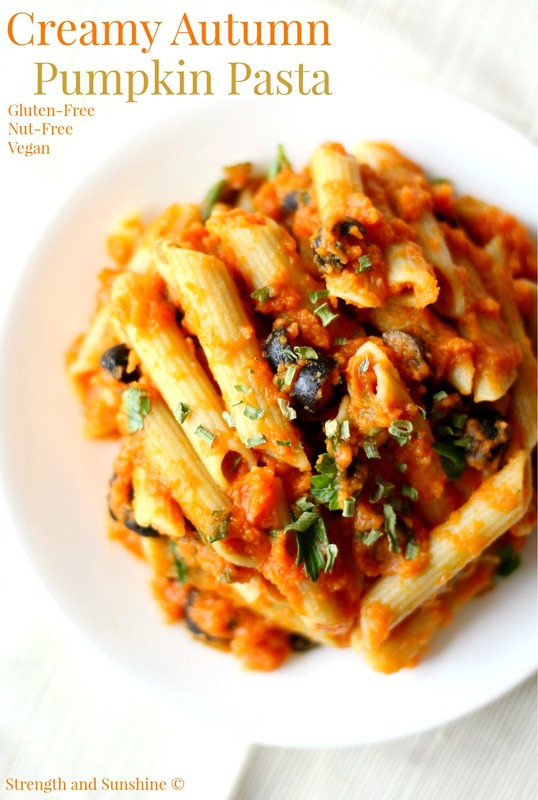 LOTS of delicious, cruelty-free recipes that could “wow” your guests, friends, family. Something for everyone. Happy (almost) Thanksgiving! I hope all of you have a wonderful holiday with family and friends. Have mercy Mandy! I’m supposed to be working but instead I’m drooling on my phone! I see numerous recipes I’ll be making! Thanks for doing all the work! Wowzers! What a roundup of droolworthy holiday favorites! I would like to be at THIS holiday gathering! 🙂 Thank you so much for including a few of mine! You are so sweet. Wow, you have made me seriously hungry. After I leave this comment, it’s time for lunch ASAP. Thank you for including my salad! Such a nice surprise. Also, I’m glad for the reminder about Kittee’s Brussels sprouts. I meant to make them when she posted the recipe, and somehow they slipped my mind. I always associate the holidays with plant and vegan fare! Haha! I guess because I always cook that way and try to impress my family with a big plant-based (and GF) show stopper! Thank you so much mama for including all those recipes of mine! I hope you have a fabulous holiday with your family, filled with amazing plant based treats!! You have a fabulous list going on here!! Much love! I know! I have a to do list as long as my arm! Loved seeing all these recipes! I bookmarked a few of them for the holidays! The videos you posted i’ve seen one of them and loved it so thanks for sharing!